The hive mind of the internet is a powerful thing, not to be underestimated. It's given us marvels like Wikipedia, memes, and crowdfunded sequels to Zach Braff movies, but its energy is unwieldy. An attempt to include people can derail even the most serious collaborations. The latest evidence of this comes fresh out of Australia, where the name of the Sydney Harbor Ferry was up to the public to decide. Their considered decision: Ferry McFerryface. 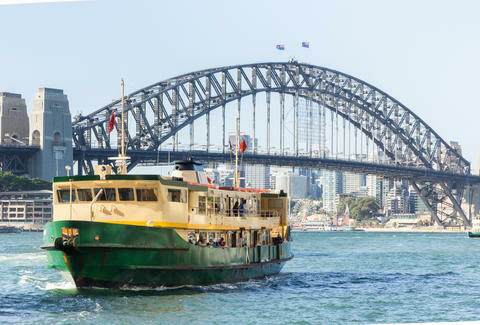 Hundreds of residents of Sydney voted through an official website and through the hashtag "#yourferry." Ferry McFerryface was actually the runner up in this election, with Boaty McBoatface coming in first. But that name had already been voted upon as the name of a British vessel last year. Apparently, the Brits are more invested in the dignity of their Maritime vessels: They opted for the tamer "RSS Sir David Attenborough" and named a small research submarine Boaty McBoatface. "Given Boaty was already taken by another vessel, we've gone with the next most popular name nominated by Sydneysiders," Minister for Transport and Infrastructure Andrew Constance said, according to Australia Broadcasting Corporation. "Ferry McFerryface will be the harbour's newest icon, and I hope it brings a smile to the faces of visitors and locals alike." All in all, everyone seems to be taking the shenanigans in stride. He'd previously urged the public, "Let's really generate some of the best names possible." The other boats in this batch of new ferries have more traditional names thus far: "Victor Chang (Australian heart surgeon), Fred Hollows (ophthalmologist) and Catherine Hamlin (obstetrician)," the Australia Broadcasting Corporation reports. Making tributes to exemplary people is an understandable impulse, but Ferry McFerryface is clearly the winner of the name game. Not everyone is thrilled about the results of the poll. "It was funny when the Brits proposed Boaty McBoatface. It was still funny when the Swedes used Trainy McTrainface," a Facebook user was as saying quoted by USA Today. "Sadly the joke is wearing thin now though, and Ferry McFerryface just doesn't roll off the tongue as easily." It's also sad that people lose their capacity for joy over dumb jokes. Ferry McFerryface is incredibly hard to say. It's a terrible name for a boat. This is its genius. James Chrisman is a News Writer at Thrillist who sometimes goes by Writer McWriterface. Send news tips to news@thrillist.com and follow him on Twitter @james_chrisman2.